Our range of products include Water Plants such as Water Purification Plants, Water Treatment Plant, Water Plant, RO Plant, Bottled Mineral Water Plants, Mineral Water Plant and many more items. We are manufacturer and supplier of Water Treatment Plant. These plants are made from top quality material procured from reliable sources. We also undertake customized projects following the specific requirements of clients. Removes Smaller contaminants and any other remaining particles and protects the RO Membrane. Removes undesirable Toxic Chemicals, Dissolved Solids, Virus and Bacteria. We are manufacturer and supplier of Drinking Water Plant. Our water plants are ideal to remove contamination such as bacteria, virus, and other suspended matters. Our range can also be customized as per the specific requirements by clients. We are prominent manufacturer and supplier of Industrial RO Purifier Plant. Our Industrial RO Purifier Plant is made by using quality material which is sourced from leading vendors of the industry. 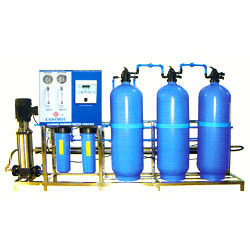 The RO Water Purifiers are available in the market at industry leading prices. Looking for Water Purification Plants ?